Coastal barrens, wooded trails, sandy beaches. An ideal place to spend a full day exploring and/or relaxing. Taylor Head Provincial Park is a unique land formation. The park is located on a finger like land mass that juts over 6 km out into the Atlantic Ocean. For this reason, trail users should prepare for higher winds and lower temperatures than experienced inland. The Taylor Head area is scattered with coastline cliffs and steep slopes. Exercise caution when exploring the area, especially if small children are joining your party. The trails at Taylor Head offer three different hikes. Each begins at the fourth parking area of the parking lot. The shortest of the three, the beach walk (2 km return), begins from the beach at Psyche Cove and follows the coastline. Along this route notice a barrier beach pond is separated from the sea. At the end of the beach, you can return to the parking lot or join the Spry Bay Trail. The Spry Bay Trail and Headlands Trail are two loops forming an almost figure- eight on the tip of Taylor Head. You can do each loop separately or combine them for a longer hike (7 km loop). The vegetation in this area is limited by the salt air, spray, and high winds that are a constant in this area. For this reason, stunted white spruce, tamarack (also known as hackmatack or larch), juniper, and a variety of lichens are the main survivors here. The Bob Bluff and Bull Beach trails offer the longest hikes here (9.5 km) along with some of the nicest views. While admiring the scenery of Taylor Head Bay, the rugged segmented rock coastline, and the islands across Mushaboom Harbour, be on the lookout for a seal or two. 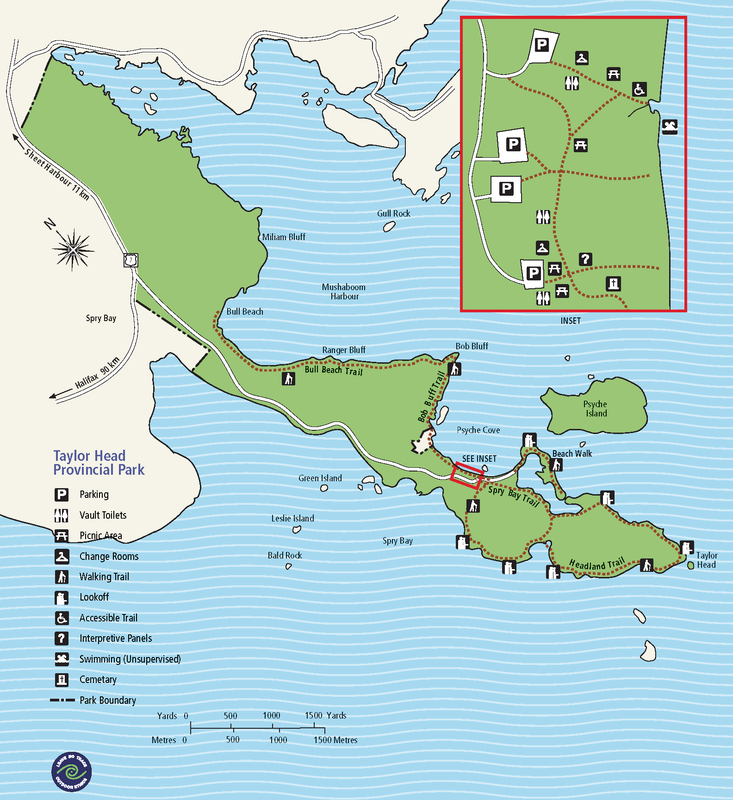 Taylor Head Provincial Park provides pit toilets, picnic tables, change houses, and an interpretive kiosk.